On any photographic forum, it doesn't take much effort to find old or new discussions on how to set the “proper” exposure while shooting, and even what exactly “proper exposure” is. The question of setting exposure was and is one of the most commonly-discussed topics on forums and blogs. Newbies (and not) bring it up again and again and receive all sorts of explanations – long and short, deeply “scientific” and completely “practical”, starting with advice to use the in-camera histogram, “zebras,” manual exposure mode, corrections and compensation, special camera modes to increase the dynamic range and increase the reliability of the histogram and other overexposure indicators, a separate exposure meter, Adams’s exposure formula, metering the incident light, spot measurement, a grey card, the back of one’s hand, green grass, an ExpoDisk, the sunny 16 rule, Magic Cube, etc., etc. The number, volume, and force of the emotions present in discussions about correctly setting exposure for each shot, the number of gadgets and tricks to achieve the result, as well as the number of articles written on this topic create the impression that the one and only purpose of a photographer is to shoot based on the principle of “one shot, one kill.” The ability to immediately nail the exposure for each shot is viewed by some almost as an indicator of a photographer’s skill. Often, an experienced professional photographer will, upon hearing the question of how one should choose exposure while shooting, respond that you should “Bracket your shots when the lighting conditions are complex. Or, even better, bracket all of your shots. I do it all the time.” That’s because problems with exposure are not something that only a novice can encounter; of course if one is not a full-time pro, he has more of those. To illustrate this article, we decided to perform an experiment. It was a sunny day, we set the camera to aperture priority, matrix metering, and the bracketing was set to 5 frames, in a progression 0 EV, -1 1/3 EV, -2/3 EV, +2/3 EV, +1 1/3 EV. To keep the experiment “clean”, the camera was given to a complete novice, the shooting time was limited, and we intervened only once (we will explain why and how a little later). On scene 2556 (to the left, auto-exposed with 0 exposure correction), the sky is already blown out and has no color; for shots 2559 (+2/3 EV) and 2560 (+1 1/3 EV) the clipping in the sky is obviously worse. Shot 2557 (-1 1/3 EV): according to the RAW histogram and RAW exposure statistics there’s a bit more underexposure in the blue and red channels than would be desired. 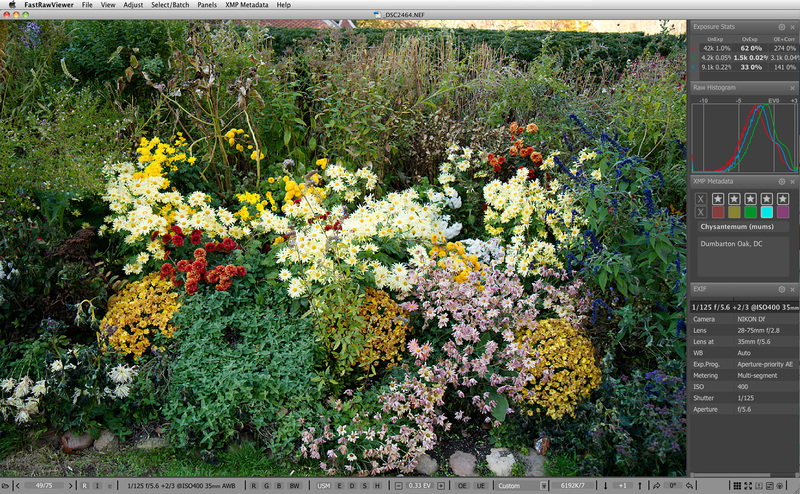 Notice that the histograms of the embedded JPEGs don’t point to a single useful shot – they’re all underexposed and overexposed at once, according to the JPEG histograms. The best-exposed shot of the scene is 2558 (-2/3 EV): using Shadow Boost, we can see that the details in the shadows are well-preserved (see the image on the left) and that the shadows don’t have much objectionable noise (see middle image); furthermore, the sky and highlights are intact, with only a few overexposed pixels on some of the leaves (see the image on the right). 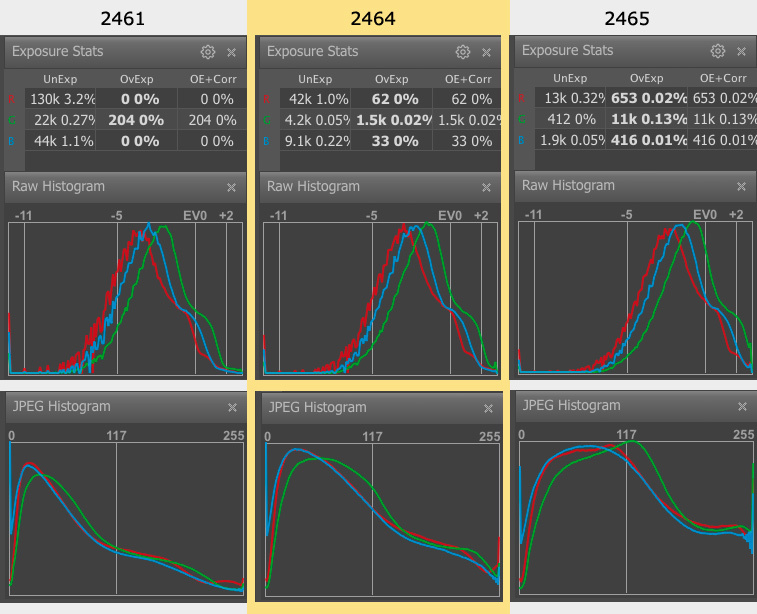 The RAW histogram and RAW exposure statistics show that shot 2440 is exposed almost perfectly, however the histogram for the embedded JPEG insists that it’s underexposed in all channels and is VERY underexposed in the blue channel. The same situation is visible with shot 2439. 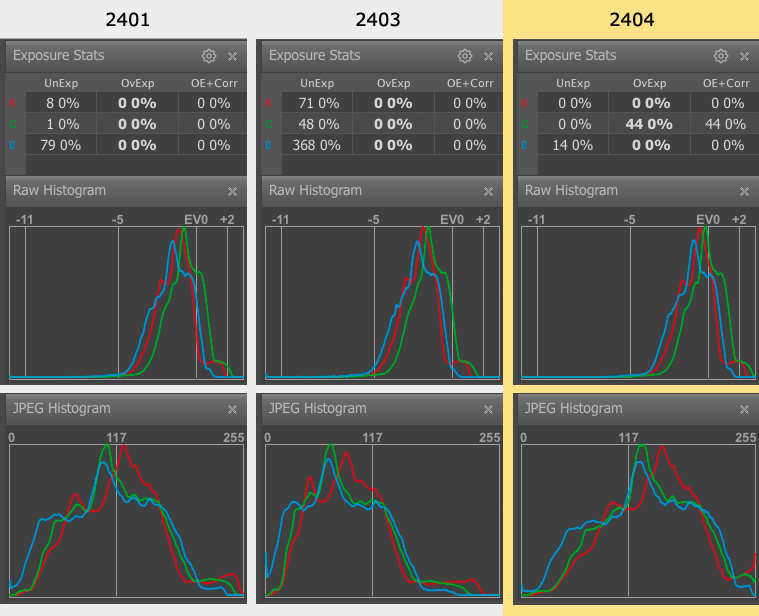 So much for trustworthiness of JPEG histogram! Depending on the how the image is going to be displayed (in terms of size, media, etc. ), and the quirks of the converter being used, one could choose either of the two shots. We chose 2439, because we wanted to completely save all of the details on the illuminated chrysanthemum petals (areas that were blown out in shot 2440) and didn’t want to risk those details being poorly reconstructed in a converter. However, as we noted above, depending on the circumstances of conversion and display, shot 2439 could also be chosen. Furthermore, sometimes the shot picked out of a bracketed series wasn’t the one the exposure of which was the best technically speaking, but rather one that was a bit “over” or “under” exposed, because it better reflected the moment or the photographer’s analysis of the scene. In many places that trained pro photographers, the iron-clad lesson used to be that one always bracketed, even with wide format and expensive film. With the development of digital cameras having the screen on the back of the camera, photographers got the idea that the problems that came into being on film cameras were a thing of the past: one no longer needed to take film to be developed to see just one photograph – now, one could look at the camera screen, instantly see the image, and understand whether the exposure was correct or not. This led to the idea that bracketing was unnecessary. We sometimes tend to forget that the correctness of the exposure, in the overwhelming majority of cases, can only be judged afterwards, in the comfort of your digital darkroom – for example, all of the highlights are alright, but the shadows are so dark that any attempt to raise them reveals noise, color blotches, stripes. This will only be seen in a converter. Furthermore, different converters deal differently with raising shadows and recovering highlights, and different cameras are differently noisy, and even differently depending on the ISO speed set for them. Another consideration is that those shots that converters can’t deal with today because of their exposure “issues” might become quite doable in a few years – converters with their recovery algorithms and noise reduction methods most certainly progress. Figure 14. 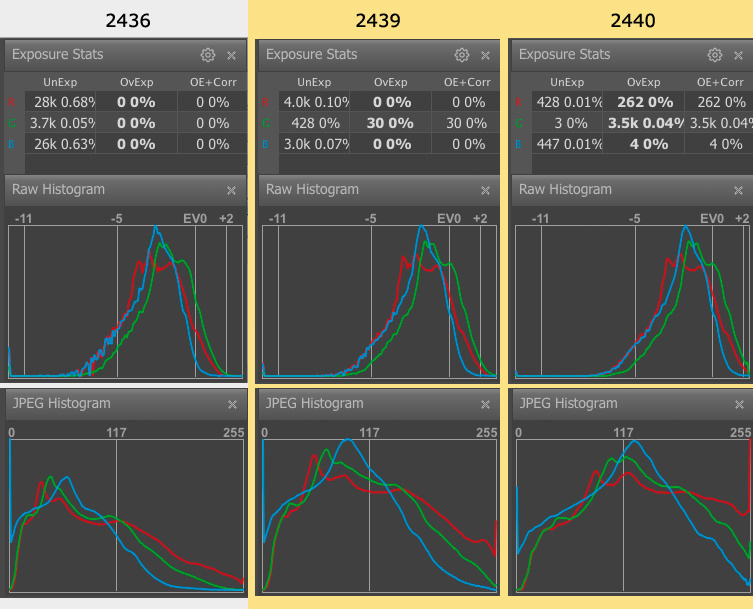 Series 2336 – 2341: shots displayed are 2336 (autoexposure), 2339 ( +2/3 EV) and 2340 (+1 1/3EV). Shot 2336 is the best, since the blowout in the highlights in the other two shots turns to the doorframe into a white stain. The problem of exposure becomes especially unpleasant when the dynamic range of the scene doesn’t fit in the useful dynamic range of the camera. How do we find this out? Some would say that it’s obvious! All we need to do is measure the entire scene with the spot-meter (preferably the one in the camera) and calculate the difference between the minimum and maximum values. If it’s less than the useful dynamic range, you can confidently set the exposure about 3 stops above the spot-meter’s maximum value. Indeed, that works. But what if the range of the scene is more? Furthermore, try preforming this exercise and realize how much time it takes (camera manufacturers, we’re looking at you – you could give us the results instantly, it’s known inside the camera, but why exert yourselves eh?). We have chosen the shot 2532 (-1 1/3 EV) with the least overexposure in the sky. 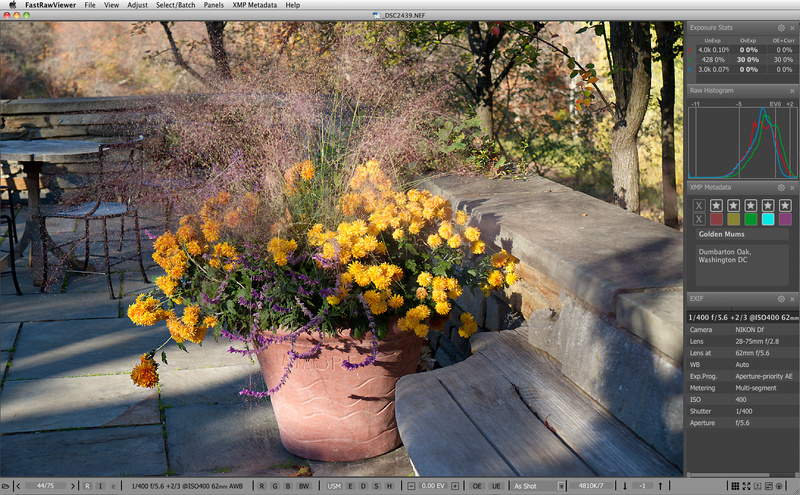 Shadow Boost – there are details even in the deepest shadows, and not much noise is visible (two shots on the left); Focus Peaking – all of the shadows have well-developed details (shot that is third from the left, green overlay represent in-focus detailed areas of the shot); Highlight Inspection – the sky is completely preserved (shot on the right). Once again Shadow Boost (we have increased its amount in Preferences) shows that even deep shadows are not so noisy (right); Focus Peaking confirms that we have a lot of details in shadows (center), and Highlight Inspection demonstrates that our highlights are quite safe (left). And don’t depend too much on the image on the camera back. Culling based on embedded JPEG (whether during the shoot or after it), as we have shown many times both in this article and prior, can be and usually is very, very unreliable. And the saddest thing is that, as Murphy’s Law dictates, it will definitely fail you right when the shoot was the most important for you and can’t be repeated (re-done).